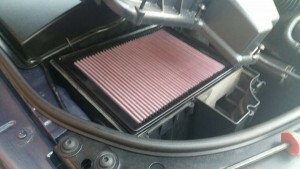 Air intake is an important factor in maintaining high engine performance and efficiency. We supply and fit only the best Air Induction Kits from K&N, Pipercross and BMC at competitive prices. Please call us for sound professional advice. Allowing the engine to have all the air it needs results in more power and torque, and possibly a slight improvement in fuel economy depending on the way you choose to use the extra power. Performance air induction systems achieve higher air flows by doing away with air deflection (noise suppression) and the choking effect of standard paper filters. 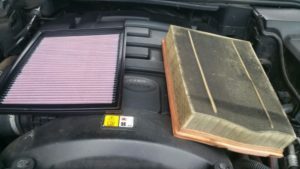 We also supply and fit uprated panel filters, which as you can see offer improved induction over standard filters, and are re useable. Horsepower, torque, and acceleration increase. Entire factory air intake system replacement. K&N Million Mile Limited Warranty®. Improved engine sound and good looks. Direct replacement of the air box. 30% greater air flows over standard. Vehicle manufacturers warranty not affected. The BMC CDA filtering system comprises a cylindrical carbon air box and a washable air filtering element. 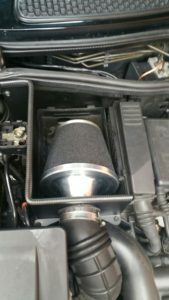 The vehicle’s original air box is replaced with the BMC CDA (carbon dynamic air box) which channels cold air directly through an internal airflow deflector to the filter where it is drawn into the engine with very little pressure drop (patented system). The CDA system also includes 60 cm black alloy ducting for connection to an air intake on the front of the car. Dyno and Datron Laser tests demonstrated great performance increases. Please call us for more information and a free quotation on the best kit for your car.